Hi, guys! Checking in today with a couple of cards I made last month. 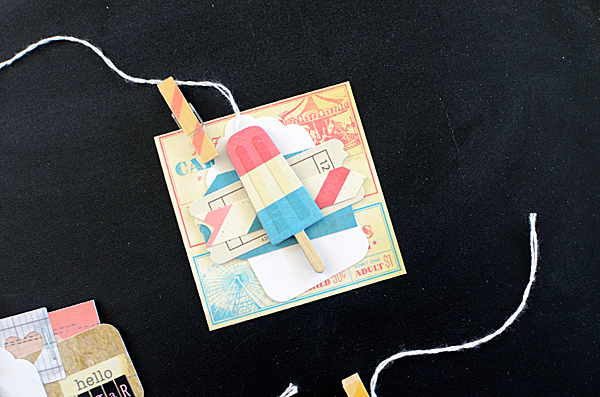 It seems like I've only created cards and projects with Crate Paper products for the last year, yet I do have loads of things by other companies...I just have so much Crate--and entire collections of it--that it's easiest just to use that stuff. It's usually what is within arm's reach, too. (Oh, and I love it, which helps!) But today I actually have something I made using other things (ok, you might still be able to spot a couple CP items). 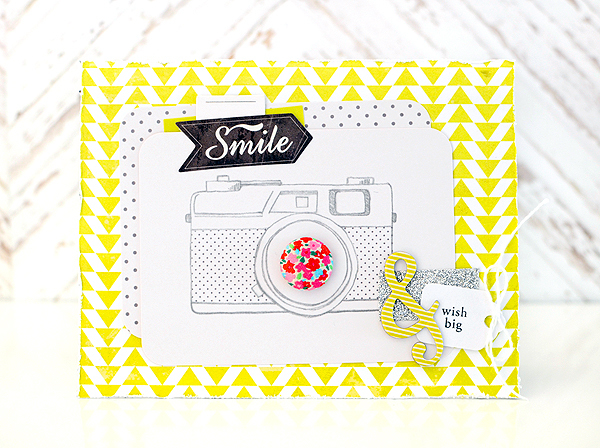 First up is this little number, with the sketched camera journaling card front and center. 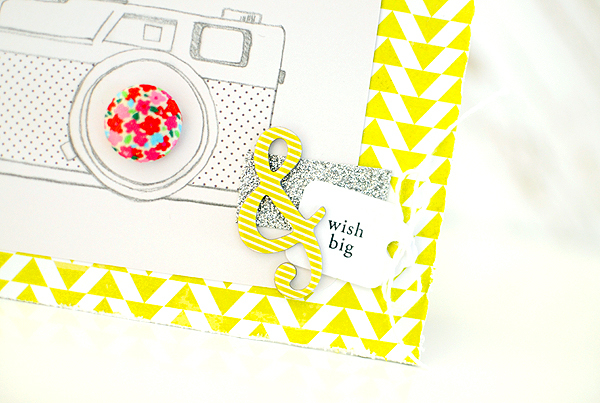 The polka dot pattern behind it is another jc; both are from the Dear Lizzy Polka Dot Party Project Life kit. 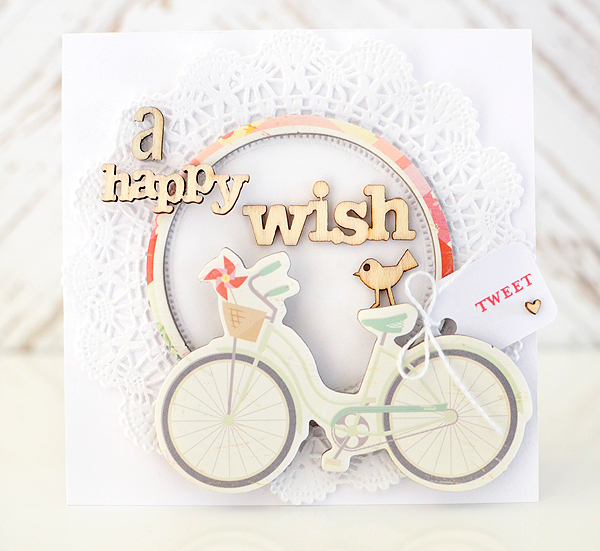 I paired it with a patterned paper from Glitz Design's Finnley. I've seen other folks water-color these pencil-sketched cards and I've loved them! I took a simpler route, though, adding the bright floral fabric brad for an unexpected burst of color. Does anyone else have the issue of Blogger dulling their photos? I've read endless tips and articles on fixes for it but it still happens sometimes. These bike photos are prime examples--they look much more vibrant in Photoshop than they do here. The color output is sRGB, I've resized them, saved for Web & Devices, boosted the saturation, and even closed my Google+ account (which I never used anyhow), based on online tips. If anyone has any other suggestions, please do share in the comments! Don't forget that kits and tags are on sale in my Etsy shop through Sunday, August 24...Pretty please tell your friends! 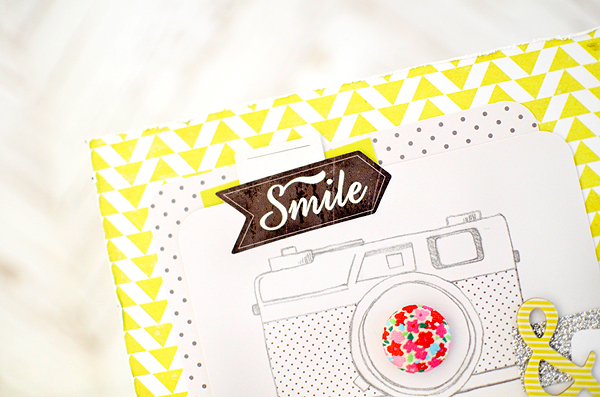 Get yourself some Summer Sweets tags before summer is officially over! I'll have those Gossamer Blue sneak peaks for you in a day or two...I'm finding so much fun stuff to play with in the September kits! Oh my, that button in the middle of all that yellow??? Perfect punctuation of color. Can't stop looking at it! :-) I know what you mean, I have a ton of Crate from when I was a DT, but LOVE it thank goodness :-) Beautiful cards! 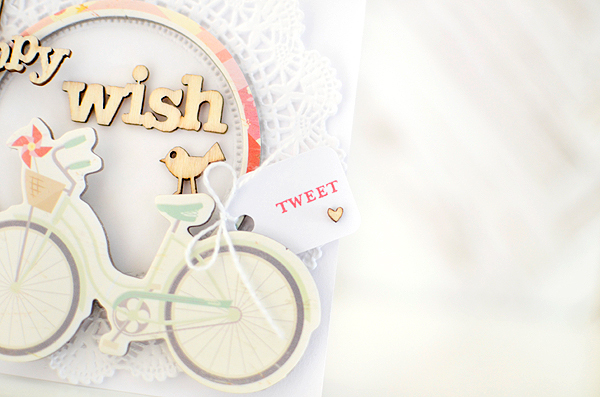 I love how you made that pretty circle to separate the doily and the 1st card really pops!